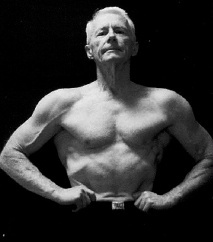 Logan Franklin, senior fitness advocate. I should say right away that I do not have any kind of medical expertise other than basic First Aid and CPR (cardiopulmonary resuscitation). And I believe anyone - especially any senior - should have a physical examination and talk with his or her doctor before starting a fitness program. My work background has been in newspapers and publishing (I retired from the field several years ago). That experience has made me pretty good at looking things up, sorting through them, and finding what is important. Still, you might ask what makes me think I know something worth sharing about senior fitness? It is a reasonable question. As I write this today (in 2007), I am 71 years old. I began exercising in my early teens and, in one form of exercise or another, I’ve never stopped. The pictures here show me at about ages 15, 34, and 67. 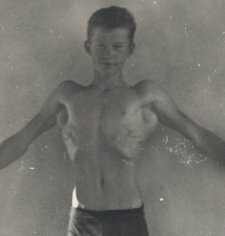 With all that flexing, you might wonder why I didn’t take things further to become a competitive bodybuilder. Well, I liked what weight training did for me, but competition bodybuilding did not appeal to me personally. 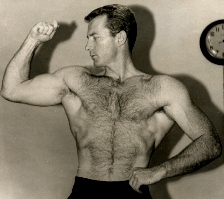 Even so, some of my earliest positive impressions of weight training came from the pre-steroid Strength & Health and Iron Man health and muscle magazines of the 1950s. And certainly I was greatly influenced by the first gym I ever belonged to, the famous Yarick’s Gym in Oakland, California. So weight training, for the most part, has been at the center of my fitness workouts. However, there are other sports, exercise practices, and outdoor activities I have been involved in over the years. They included martial arts, swimming, running, handball, and backpacking. I have been a high school soccer coach and a certified personal trainer and cardio-kickboxing instructor. My wife Patty and I have team taught classes at a health club. I have self-published two books (not in print at his time) on senior fitness, Gray Iron: A Fitness Guide for Senior Men and Women, and Living the Fitness Lifestyle. The Senior-Exercise-Central site combines my fondness for information gathering with exercise and fitness experience to provide seniors with honest and practical information. Find more background at Amelia Phillips interviews Logan Franklin. It has been 10 years since I wrote the beginners’ book, Gray Iron: A Fitness Guide for Senior Men and Women. I’m 78 years old now, and several people have asked about my present exercise and dietary habits. As you would expect, my workouts have evolved, as I have made age appropriate adjustments. In my 60s, I was still lifting heavy weights (heavy for me anyway) and also led cardio kickboxing classes for several years at a commercial health club. A few years ago, I left the health club and set up a simple home gym arrangement, which I still have and use periodically. I like working out at home and thought I would not join another gym at this stage of my life. I was wrong. My wife talked me into getting a new health club membership. The gym we belong to now is quite modern and well managed. Will I go back to working out at home again? Maybe. But for now I'm pleased going to a commercial gym. I exercise six days a week, typically alternating one day of resistance training with one day of cardio. That may sound like a lot, especially for someone my age, but the workouts are concise and brief. For variety, I use a mixture of dumbbells, cables, resistance bands, body-weight movements, and kettlebells. On resistance training days, I warm-up with a few light calisthenics before beginning a workout; I also do a few minutes of relaxed stretching after completing it. The entire session takes roughly 35-to 40-minutes. When I was younger, I’d often do several low-rep sets of each exercise with heavy weights. Today I vary my exercise repetitions but tend to stay in a higher range, using moderate weights. I should add that even when I was younger, I didn’t believe in regular training to absolute failure and certainly would not do it at my age today. On most cardio days I use a treadmill, a stationary bike, or Concept 2 rower, or I walk 30- to 35-minutes. Within that time, there’s a warm-up, then a moderate pace and a couple of reasonably hard intervals, and a 5-minute cool-down. One day a week, instead of going to the gym, my wife and I like to hike in the hills, usually for about an hour. I am almost exclusively lacto-ovo vegetarian. I say “almost” because I do enjoy fish. I think that's called being pescatarian. And once a year, on Christmas Day, I eat meat at dinner with my wife’s family. I don’t try to convince others to be vegetarian, or almost vegetarian like I am, but I prefer it. I enjoy my food choices, and it is certainly healthful, though I make no claim that a healthful diet cannot include some lean meat. I eat the least processed foods available and, when possible, foods untreated with chemicals or pesticides. But if they are not organic, I don't lose sleep over it. I do avoid fast-foods like the plague. I take a 1000-mg capsule of fish oil daily; 1000-IU of Vitamin D. You can find further thoughts on dietary supplements here. I use whey protein powder, not because I think I can’t get enough protein without it, but for convenience it mixes well with berries in smoothies. I often enjoy a glass of wine or a beer with dinner. These days, one is about my limit. I make it a point to drink at least one cup of water every time I eat. I also drink a small cup before workouts and drink a small cup immediately afterward.